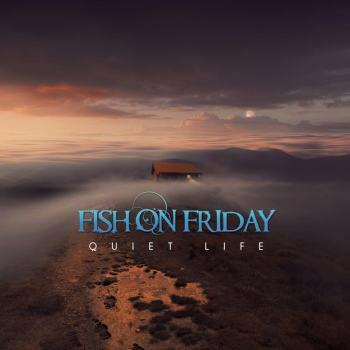 Quiet Life is the 4th album from this originally Belgian band Fish On Friday. I'm going in clean, because I haven't heard any of their earlier material. I read some reviews of their former albums though. Some of the names I encountered are well known to me. Nick Beggs, Theo Travis and Alan Parsons are indeed the big ones. Also a shipload of other guests joined the team of musicians. Even Nick's daughter Lula Beggs joined in on a few tracks. All this info raises expectations. Let's see if they'll meet them. On a personal note I can appreciate the effort to make a song about the tragic MH17 disaster. There were people from my surroundings on that plane too. That gives this good song an extra dimension. The only track produced by Alan Parsons (In The Key Of Silence) shows us that this band's excellence still can be lifted to a higher level. There are some familiar ingredients that can be remembered from The Beatles to Tears For Fears. No, I don't doubt the quality of William Beckers and Frank van Bogaert but you can hear the difference. Next time try to seduce the good man to do the entire album? In general I can say to this cocktail of prog. : “Throw in some Porcupine Tree, mix it with Riverside and RPWL (instead of Pink Floyd) pour some easy listening sauce like Blackfield in it. And complete it with the unique sound of Mr. Beggs that completes the whole thing to a nice album that has got me hooked.” I'm a fan! William and Frank, goed gedaan!